Your reception is the party time for you and friends to celebrate your exciting day . You are now married!! 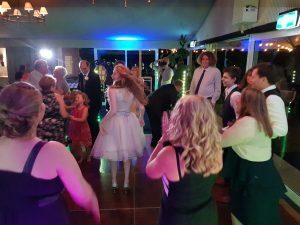 I will do my best to provide you with the right music for every part of your event . There are a special parts of the night that are enhanced by the right song that has special meaning to you for whatever reason . First Dance. The first dance can be the biggest cause of stress for the whole wedding, but really you can’t do anything wrong oh well maybe fall over or stand on the brides dress/veil that could be interesting but most of you friends will love it we are only human after all ( thanks Billy Joel) . Traditionally it is the very first song you danced to as a couple but depending where you met that may not be appropriate. I can work with you if you want to make a compilation of songs mixed or slammed together or even just a certain part of a song. Whatever idea you have for your first dance just ask, if I can help you do it I will . 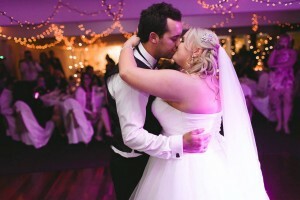 Here are some first dance suggestions First Dance Suggestions I can also do dancing on a cloud for your first dance, makes it look quite special but this would be an add on at extra cost. Bouquet Toss The time has come to throw you bouquet , here is a little background on the Bouquet Toss. Hundreds of years ago, it was thought to be very good luck to touch the bride. This often caused discomfort and invasion of privacy to the bride, since guests would typically stand around her in an attempt to rip the gown off! (Uh, no thanks!) In order to deter guests, the bride began tossing their bouquets into the crowds to distract people, then making a break for it with her husband to the bridal chamber. The groom would open the door and toss out the garter once the couple was inside. People just wanted pieces of the bride’s accessories because she was married. So guests were naturally thrilled to grab the flowers, since they, too, were thought to bring romantic luck for the future. Over the years, this act of distraction has turned into a tradition meant for the bride to pass on her good fortune to one single lady. Whoever catches the bouquet at a wedding is thought to be the next lady in line to wed. Unlike medieval times, however, today the bride doesn’t scamper away, but relishes the moment for her ability to unknowingly choose who will follow in her footsteps next, while the guests now respect the beauty of the bride and her gown, as opposed to ripping it off of her. Leaving Song Really this could be anything but it’s great to have a fun song so your guests can form a circle or an archway for you to walk around or through say goodbye to everyone. Make a big thing out of your leaving been a fantastic day. SPEECHES It may well be that all or some of your speakers would like a song when they are announced or even something play at an appropriate time during their speech so if that is required let me know and it will be arranged. Dinner Music This part of the music playlist is often overlooked and you don’t need to make a playlist but rather a style you like i.e. soft jazz, triple j/indie, piano music or anything you like it is only basically background music but it still add to the atmosphere . Dance Time The part that everyone looks forward to , I believe that you should choose songs that you and your friends that are coming to the wedding remember fondly from when you all went out and partied , songs that your parents liked to dance to and any other relatives you are close to . 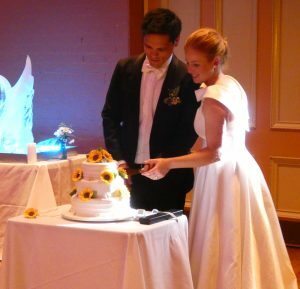 While it is your wedding you want everyone to have fun and remember how great it was. Are there any strong ethnic backgrounds that need some special music for these guests to feel special, like you thought of them as well. It doesn’t have to be like a night club , not everyone will dance and very few people will dance all night so a good balance of music across the ages is the best recipe for a great night of dancing. 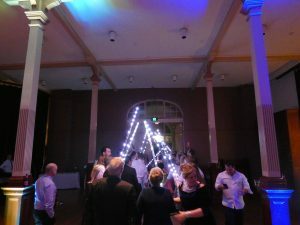 Lighting Basic up lighting is included in the package as is basic dance floor lighting. More can be added as extras it you so desire like moving heads even with special gobos (projected patterns even your names ) but these come at an extra cost so please suggest whatever you have in mind and we can see what we can come up with. Same with smoke and low lying fog , standard smoke machine included but depends on whether or not the venue will allow it .Low lying fog is expensive and very short lived but anything ( well almost) can be done.